I've spent a lot of time in the bedroom lately... resting and recuperating after my surgery. Quite frankly it has driven me mad. Hubby and I had already decided that our bedroom would be the next room on the hit list in our house. Last year we renovated the attic room for the little man and the play room and this year it's our turn. I want to make our room into a peaceful haven where hubby and I can relax and unwind and have some special time together. I'd also like a small spot where I can lock myself away from the general craziness and get on with some blogging work. I love the scandanavian style. White walls, lots of neutral fabrics, wools, maybe a sheepskin rug and some natural wood too. I've put together some ideas on a Pinterest board if you'd like to take a look. But I'd also like to inject a bit of colour, bring in a bit of passion. The thing that's driving me most crazy at the moment is our duvet cover. It's a pretty butterfly design and was great value for money but it has certainly seen better days and has me lusting for something new. With time on my hands I began a bit of retail therapy, I love a spot of Internet shopping. Here is a short list of beautiful bedding sets I discovered from the Yorkshire Linen Co and Ponden Home Interiors. 1. Stag Natural Duvet Cover Set - Double. RRP £17.99. The stag design is bang on trend and the beige colour makes it feel really warm. I love that this design is also fully reversible. The red tartan injects that pop of colour and you can always swap the cover over when you fancy a change, like getting two covers for the price of one. 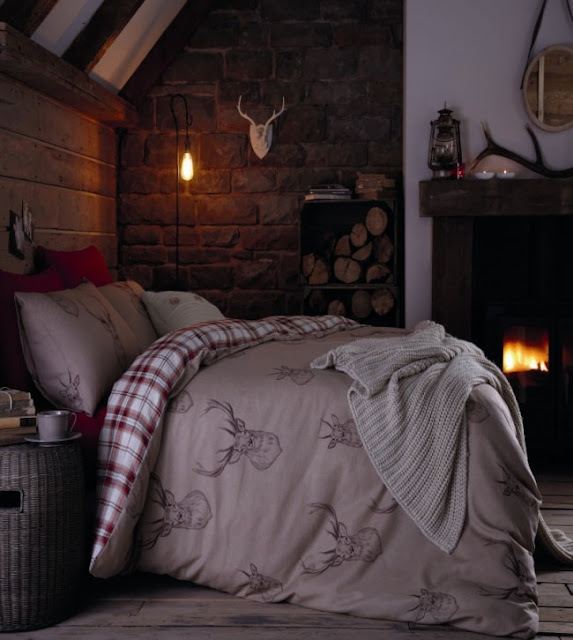 I love the Scandinavia feel here too with the woollen throw. This would bring comfort and style to our room at excellent value. 2. 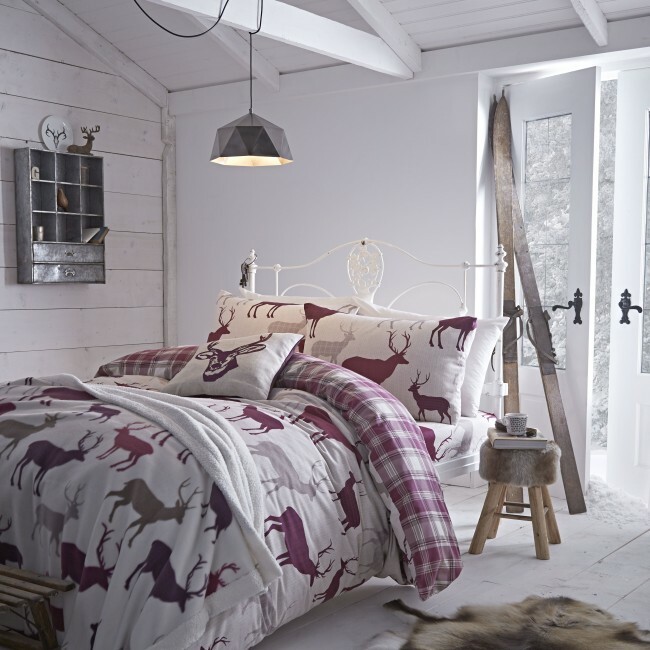 Grampian Stag - Flannelette Duvet Cover Set - Double RRP: £26.09. Another Ultra modern design from Yorkshire Linens. Beautifully styled, just the kind of look I want in my room. This would make any bedroom feel cosy and comfortable. I really like how this one comes with a matching fitted sheet and pillowcases for a fully completed look. 3. 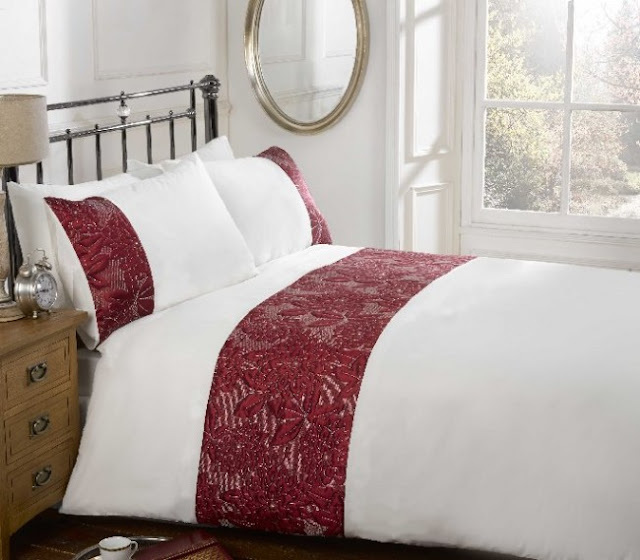 Kelso Red Duvet Cover Set - Double RRP: £17.99. 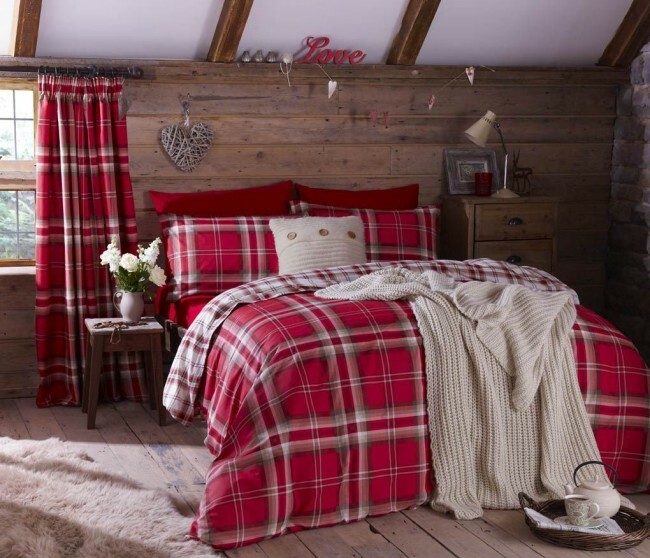 Another reversible option is this red duvet cover by Yorkshire Linen. I love the daringness of the red tartan but it can also be toned down by swapping to the lighter white based version. This would certainly add some fire and passion to the bedroom but not at the expense of comfort. 4. Darcy Red Duvet Cover Set - Double RRP: £14.99. This set is a complete bargain as it is currently retailing at less than half price. I love the crispness of the soft ivory offset by the beautiful quilted red panel. This is precisely what I was hoping to achieve. The panel has a floral and sequin detail adding that touch of glamour I was also hoping for in a timeless design. 5. Canterbury Red Duvet Cover double. RRP: £17.99. I love the vintage look to this cover and the polka dot reverse adds a dash of modern design too. I hadn't thought about a floral pattern but this is so pretty and such great value, I couldn't miss it out! 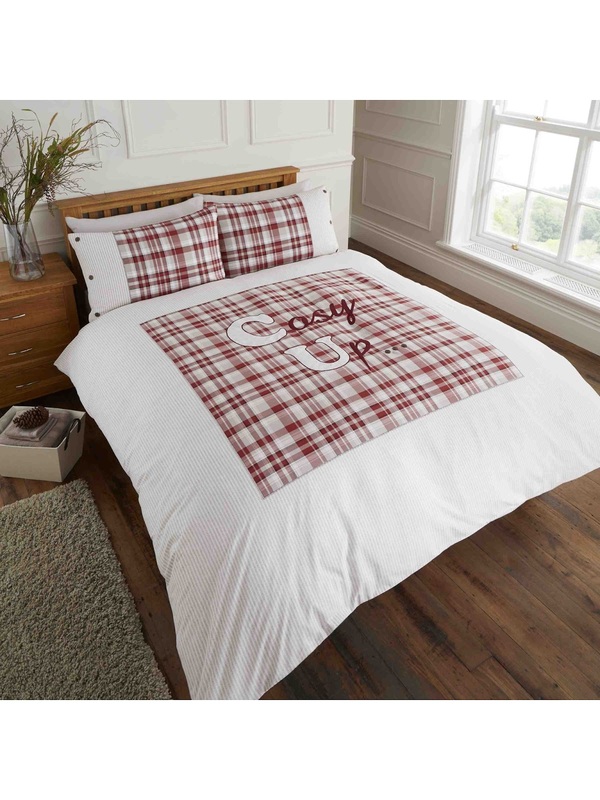 Yorkshire Linen pride themselves on supplying luxury bedding, bed-linen and soft furnishings at low prices. What is great about Yorkshire Linen is that they also have a no-quarrel return policy so if you find your item isn't exactly right you can simply return or exchange. I choose this beautiful duvet set from Ponden home interiors because I thought the faux silk material would add a touch of luxury. The delicate flower design is very pretty and understated, being limited to the embroidered panel and picked up with detailing on the cushions. I also like the option of buying matching accessories. 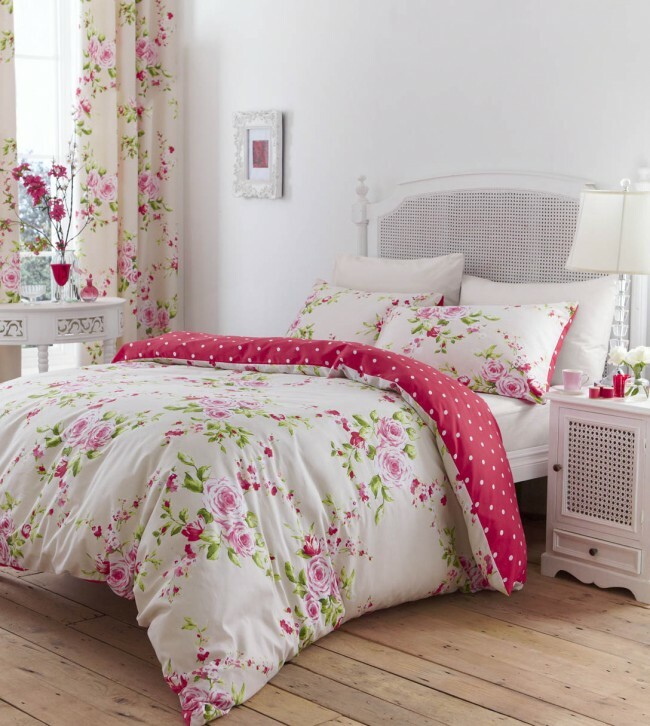 The Hearts and Flowers set would add romance to any room as the name suggests. The classic script design interspersed with the look of handprinted hearts and tiny flowers has a vintage feel. I love the feminine design of this set but I'm not sure my boys would! The styling of the room is beautiful in this photo too, just look at that mirror! My final choice is the Cosy up set. It also follows this seasons Tartan trend but I like how in this design the tartan has been limited to one panel. Whilst it is not as glamorous a choice as some of the others, I think the boys would like this design and I could see us all cosying up under this pretty yet practical cover. I hope you will follow our bedroom makeover adventure. I am super excited to get started.